The Colts came away with their third straight loss -- their deepest slump since 2015 -- and a feeling of: What's next? 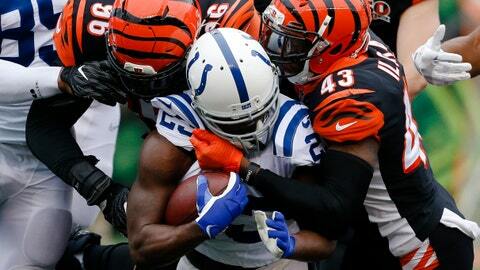 CINCINNATI — The first shutout in 15 years of the Colts left the team on the verge of coming apart at midseason. Receiver T.Y. Hilton criticized the offensive line and then apologized. Questions about coach Chuck Pagano’s future in Indianapolis heated up. Indianapolis responded by pulling together and playing its best game in nearly a month. It still wasn’t enough, leaving the Colts adrift at the halfway point. Carlos Dunlap’s interception return for a touchdown in the fourth quarter rallied the Cincinnati Bengals to a 24-23 victory Sunday. The Colts (2-6) came away with their third straight loss — their deepest slump since 2015 — and a feeling of: What’s next? The Bengals managed only 58 yards on the ground, and that included Dalton’s 10 yards in scrambles and receiver Alex Erickson’s 14-yard run. Hilton was the intended receiver on the ball that Dunlap batted into the air and returned for a touchdown. Hilton also was the target on the Colts’ final play, a fourth down pass that didn’t come close because Brissett was hit as he threw.